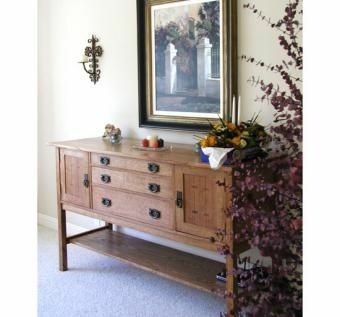 We feel that this sideboard represents our Mission Line at its very best shown in quarter sawn red oak. As with our chairs the legs are designed with the quadralinear post construction. These posts have four quartersawn boards mitered and then glued. This design technique best displays the oak's ray flake that seems to wrap around the leg. Half blind dovetails on the drawers and there are adjustable shelves behind the doors. Assembled with mortise and tenon joinery and inlayed cherry keys in both the doors and the top. Our custom hardware, which is solid bronze, highlights the piece. Dimensions: Size: 39" high by 65" wide and 22" deep.